You won't find a fitness center in the city that has more for kids than The J! From swim lessons and dance lessons, to a running club and a youth triathlon, kids can do it all at The J. And when you are working out and need someone to keep an eye on the kids, we've got you covered! 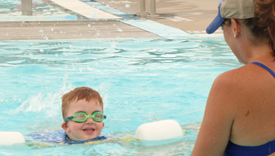 Find everything from swim lessons to Lifeguard certification in the Aquatics Department. Get your kids started early with good fitness habits with our CrossFit Kids program. Encore! at The J offers instruction in dance, acrobatics, tumbling, and music for everyone ages 2+. There's something for everyone! The J offers introductory, instructional, and competitive Sports + Recreation programs for kids K - 10th grade. See the offerings below. 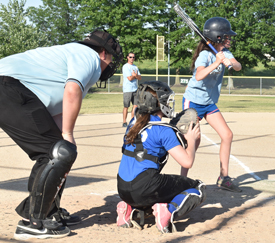 For more about Sports + Recreation offerings and information, contact Bob Hennecke at 913-327-8005. The JCC Maccabi Games®: Olympic-style sporting competitions, are one of the largest organized sports programs for Jewish teens (ages 13-16) in the world. The JCC Maccabi ArtsFest®: A unique program for creative Jewish Teens (ages 12-17) who have a strong interest in the arts. J 'Loif'ers is a new running club for all ages and all levels. Parents enjoy a Saturday Night Out while their children are having fun at The J. For children 4 years to 4th grade. Whether it's our Youth Fitness Orientation, Youth Cross Training, or Group and Team Training Sessions, we can help our personal trainers can help your kids get in shape. 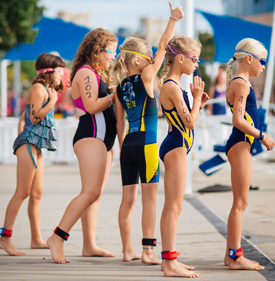 The Youth Triathlon at The J provides a fun and healthy opportunity to help children stay active during the summer. By combining swimming, biking and running in one event, participants benefit from well-rounded fitness workouts, enhancing their endurance and strength, while having a lot of fun! The J offers easy drop-in babysitting while you are working out in The Park! The Youth Fitness Zone is The J's multi-purpose workout and hangout room for older children while you are working out. Whether you're looking for a pool party, tumbling, dance, sports or games, we provide a party coordinator to make your child's birthday party perfectly memorable! Don't forget about all of the other youth programming available at The J. Check out our Child Development Center, After-School Programs, Vacation Days, Summer Camp, Safe Sitter Courses, and My Jewish Kitchen, a cooking class for children and their adult sidekicks.